I have been in business in NYC for 4 years. I’ve spent what seems like a lifetime taking care of my own skin, post facial surgeries from when I was a young girl, to caring for my clients as a practicing esthetician. It was my own experience in diminishing scar tissue for my self, from my four cleft lip repair surgeries that inspired me to become a facial expert. It always seemed to incorporate the old and new trends such as the use of royal jelly and vitamin E capsules, to high-tech products infused with fruit acids, or specially preserved time release vitamin C. However, the real common denominator was that touch was required no matter, and I realized that most of what sparks the results of these skin care products is that you have to touch yourself in order to put it on. It was my experience that consistent touch or “Self Love” was the key to seeing a glowing responsive face. Blood follows hand and high circulation is what feeds the skin from the inside out and triggers metabolic activity such as waste elimination, cell turnover and collagen production, leaving the skin looking brighter and more youthful. The sensory perception through touch links the mind to the body, the cells to positive communication such as exchanging toxins and stress for oxygen and nutrition. 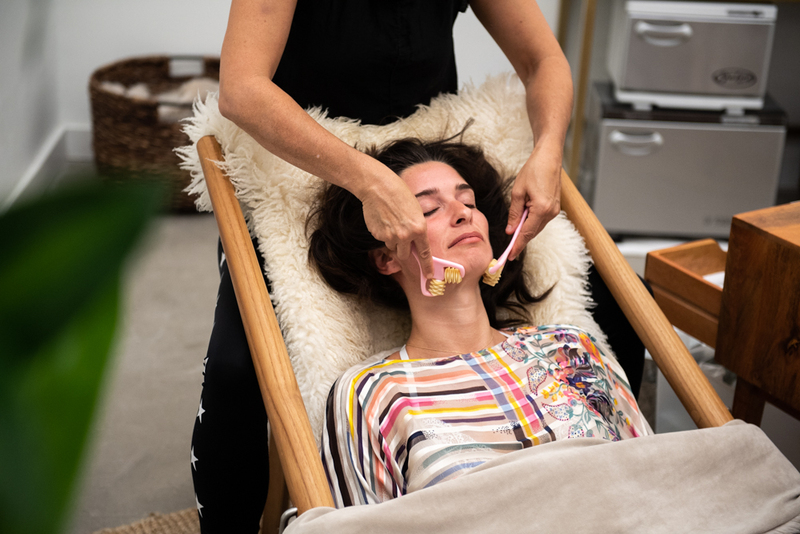 I took this a step further when beginning my own facial practice over 20 years ago, just when day spas and facials were coming back into fashion in the United States, although having always been a normal beauty practice in Europe and Asia. 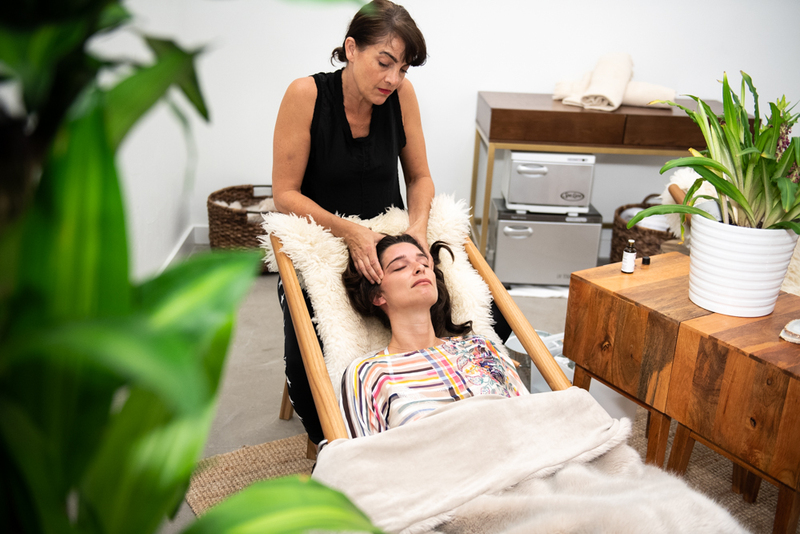 I came upon quite a bit of resistance to getting facials due to little understanding of skin and the debate over natural versus synthetic products. There was a fear of being sensitive to a facial or product or a fear of breaking out. I decided to make my practice about the skin and muscle capabilities of the face instead of product and traditional facial styles. I created the ‘Water Facial’ which was just the power of my hands, a little water and firm muscle toning technique. I started to see incredible results with my clients such as desensitizing, smoother clearer complexions, and softening of fine lines. 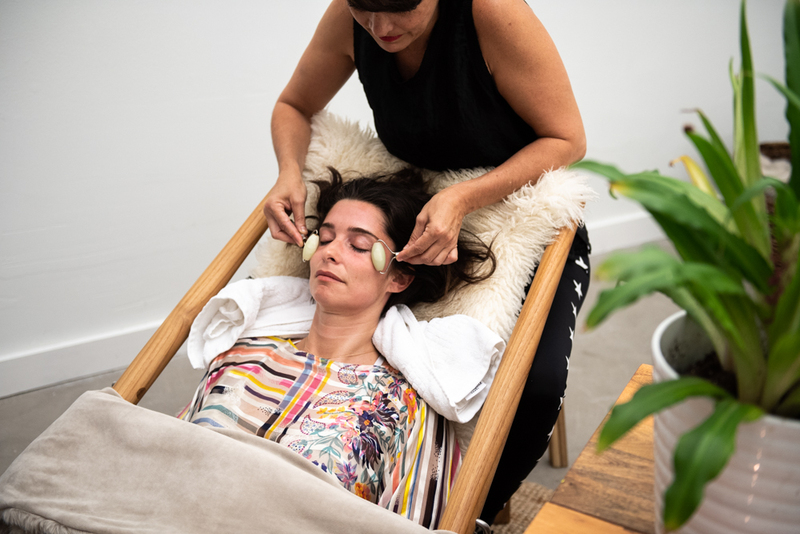 After putting that philosophy into practice infused with many years of studying indigenous forms of head, neck and face massage and exercise techniques from around the world with their own historical documented results, FaceLove was born. This company is meant to give inspiring yet accessible ways to invest in your self. The powerful combination of a little time plus touch on your face will amplify how you feel and see your own beauty. Even though face massage and face exercise has been around for centuries in many cultures and seems to be trending in the beauty experience industry...I still feel that we are the leaders and unique in our ‘high touch ‘ approach to face muscles and facial well being. The experience we have choreographed is profound in providing deep meditative results such as releasing holding patterns of the face muscles or improving mood with the engagement of the body’s natural pleasure chemicals, pain blockers or as we refer to endorphins, dopamine and serotonin as ‘happy juices and elevating your FaceJoy. It is different in that we don’t use product and move across the surface of the skin but grip, roll and uplift the face muscles. The sensation is uber stress relief, mind clearing and ‘the need you didn’t know you needed”. We literally are creating FaceLove addicts “good addiction’ as it leaves you wanting more and to do it again very soon. As with routine wellness or exercise, the more you do it the more long term long lasting benefits. Our high touch...as in 5 star, and 5 senses. 5 zones of surrender upper body touch technique. Visible stress relief, interactive meditation, elevated mood. Supporting humans in a primal giving serving way with human to human contact in our high tech world. I love Tiny’s in Tricbeca, Elevated Acre in Fidi, Teardrop Park in Battery Park to play with my kids. Mommies are time-starved and the last to receive. They give so much. We can rejuvenate and recharge mamas in a New York minute so that they can continue to give. Also we enhance sleep and mood. They can’t stop smiling for the whole day after getting a FaceLove session. "Where the talents and the needs of the world cross...there lies your vocation." -Aristotle. They can visit my website or call at (646) 573.2631.